For ten years local Daniel Sofer has sold his iconic locally-focused images at the annual summer kick-off event, Fiesta Hermosa. When he first began taking photographs of day-to-day life in Hermosa Beach he was using one of the first digital cameras. After nearly 20 years of upgrading he’s finally settled on a Canon 5D Mark II. Almost everyday Sofer took at least one photo around town and posted it onto his website. Because of his almost daily posting, Sofer’s website has developed a cult following. Another thing that brings people to his site is a web camera that he has had mounted downtown since 1997 that points towards The Strand and broadcasts the beach life to people around the world. Social networking is also a way that Sofer interacts with his followers. Many of his photographs are shot during sunrise or sunset on the local beaches. He spends a good amount of the year organizing his photographs and deciding which ones to sell at the various events around town that he attends. 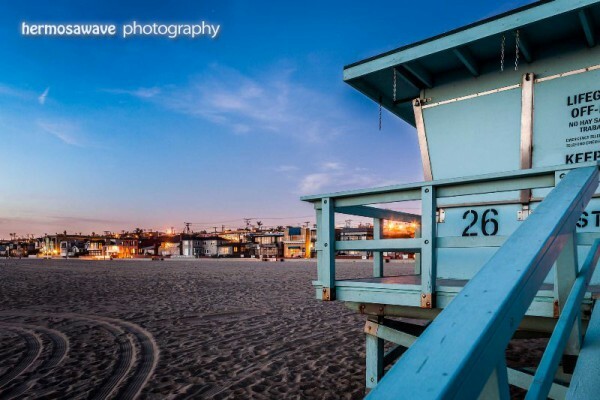 “I print things that are local and try to showcase Hermosa Beach in that beautiful dusk light,” Sofer said. His photographs are so local that often times people recognize themselves in his prints. “I have one photo of the Poopdeck and people have argued about whose bike it is outside,” said Sofer. An important aspect of his images is not only the subject matter, but the post production and the quality of the printing. He can spend hours bent over a black and white print comparing one type of paper to another, determining how to tweek the image to make it just a tiny bit better.